The 16 Trash plants were flourishing but then I noticed the quality of the fruit was Normal and did not match the quality of the plants that were at Great and Excellent. I started experimenting and was able to duplicare the issue in another save. 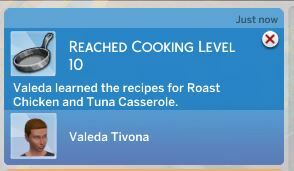 Valeda started over with new trash piles and finally has evolved the new batch to Excellent. Now to get them thru the next evolution to Superb, Magnificent, Pristine, and Perfect. Ah well .. *sigh* she now has a Yoga mat and Meditation stool and is practicing Wellness. This guy has been busy at the Puffer Dome and with some crazy Vampires trying to get a tan. There was one Prime Vampire that kept calling to come over to visit. 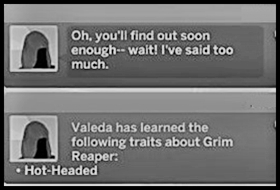 He "had something special to ask" Valeda. I said yes snd went to the nearest commumity lot (that did not require travel). I kept chatting with him in the open sun. He got sparks and I thought he would burst in flames a couple times. He just kept smoking with tiny flames during the conversation. I like the Murkland Challenge a lot but I have to play it in silence because the American Forum is acting very strange for the moment. It's so difficult to post a comment. I know a lot of people are having the same issues. And when it finally succeed, I can't edit the post. It is the same on The Danish Forum. That forum is also a mess because we don't have a admin/guru connected. I am so sorry that you're having trouble with the forums. I know I had to sign up for the Australian forum because I wanted to comment on a thread that was there. It took me forever to become an official member on there forum even though I've been a member on the American forum for years. 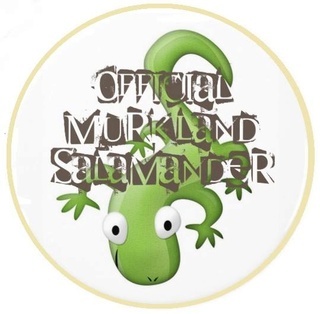 I survived the Post-Apocalyptic Murkland Starter Challenge by @Brennachan and got this nifty badge. Congrats, EQ, on completing the first challenge. I assume there will be more challenge(s). Sounded like it. So, the $1 trash fruit plants is suppose to rise in value along with the plants level. Fern's plants are Great, Excellent, Superb, and some Magnificent. Various Sims have grown the trash plant before but the fruit always stays at $1. How on earth did you get that to change? It's a wonder Fern's plants are evolving since she is frequently to ill to tend to anything. She is working on Friend of the World aspiration now. She had 9 but lost one and I can't find him/her. An interesting game for sure. The trash plants are seeming to yield the Normal fruit and sometimes the higher lever to match the plant. I tested a few random plants and some were all Normal while others had both Normal and higher quality fruit. Interesting tidbit ... Brennachan has Perfect plants on other lots. I took Martee (my newest Murklander) to check them out. Those plants also showed fruits as Normal. **Secret location** ... just be sure to keep working on those Charisma and Gardening skills. And the Puffer Dome is dangerous and claims many lives. When I started again with Martee I did not realize SOMEBODY had not turned off aging. Interesting challenge! Congrats on completing it, EQ! 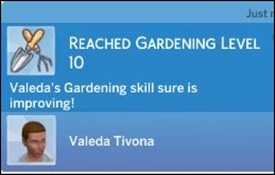 Actually did it a second time with another Sim. Will you be joining us in Murkland? I'm taking part in one too many saves at the moment, but it's fun to see yours! No way would I repeat this stage of the challenge. Fern has been frustrating at times and non cooperative at other times. Hope I can find time to tell her story! I think my Granite Falls Hermit is 'broken'? Finally meet an Adult (not an Elder) Hermit and this happens. He was in the usual Hermit outfit when they first met. Then he went to tend some plants and somewhere alone the line he came back dressed like this. Perhaps he is just expressing his feminine side? Well, it looks like he kinda has the 'chest muscles' to to do it! Love the "just my luck" expression on the female's face. Totally cracks me up every.single.time I look at it. And Yes that was my thought as well. 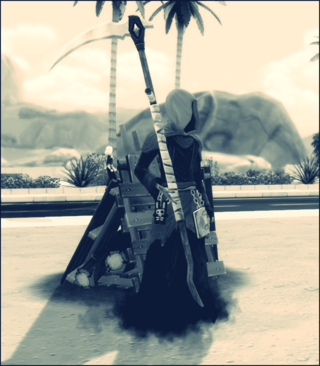 About the Murkland Sim traveling. Are they truly not suppose to use their phones to travel? How do they get to any lot outside of their neighborhood? I use the "M" key to go to map view. 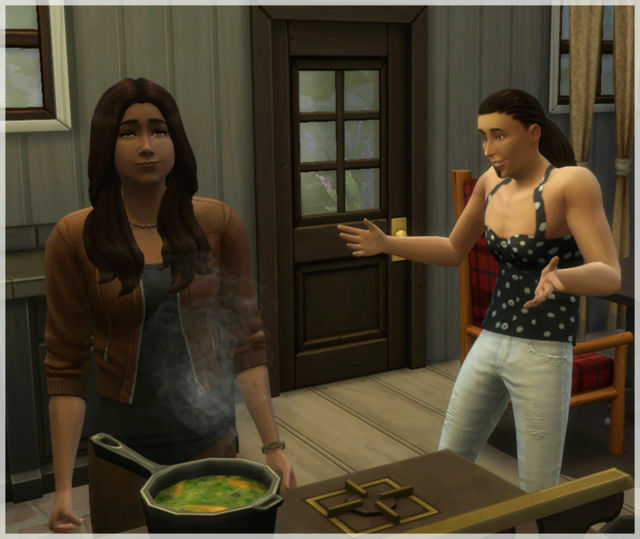 You are allowed to use the phone to go on Vacation to Granite Falls. Really enjoyed looking over your Murky adventure! Challenge Two is almost here! Go here for all creations for Challenge One Starter Challenge plus Thunder Gloom Clone Drone for Challenge Two. Enjoy! M for map view, Thank you. I am trying the Overgrown Gym challenge with Fern. I'm very hopeful she knows the ropes by now. Not sure I will have time to do screenshots.